Lucien is very sick with cancer and struggles with his parents' worry every day. But each night, through a magical gift from his father, his mind is transported to an enchanting city, Bellezza, a parallel city to Venice of our world. In Bellezza, Lucien discovers that he is a Stravagante, a rare person able to travel through worlds while sleeping.Befriended by a local girl and protected by an older Stravagante, Lucien uncovers a plot to murder the city's beloved ruler, the Duchessa. But to save the Duchessa and the city Lucien risks his only chance to return home to family and his real life. The well-paced, thick-with-plot story will hook the reader immediately and not let go until the superb, unexpected end. 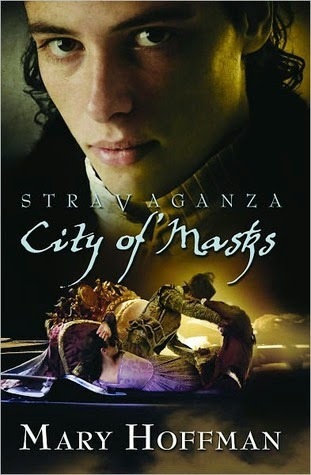 City of Masks is the first in the acclaimed Stravaganza series from the gifted Mary Hoffman. This is my second time reading this book, and I enjoyed it just as much this time as I did the last time I read it. This is one of my favorite Historical Fiction/Fantasy series and for good reason. Mary Hoffman does an excellent job of reproducing the feel of a historical Italy while at the same time not having to be completely accurate, since it is in an alternate form. Lucien is a young man who has cancer. While he is recovering from his latest bout with the illness he is given a journal by his father. This journal is more than a way to communicated with his parents when his throat is too sore for him to talk, it is a talisman that allows Lucien to travel to an alternate form of Venice. What follows is a tale of adventure and excitement, with a little history mixed in. The world Mary Hoffman builds in this book is so wonderful. It's a delightful step back in the past, but at the same time a step into another world. Bellezza is a beautiful city that makes me want to go visit Venice just to get a feel for what things are like for Lucien and his friends. The magic, or shall I say science, is delightfully woven into the story and done in such a way I almost want to look for a talisman myself. And the bits of historical information are a delight to read about. The characters are live and engaging and Hoffman does an excellent job of displaying Lucien's situation in a way that we are sympathetic and get a feel for what he's going through, but his illness doesn't rule the story. Each character, main and minor, feels like they have a real personality. Most of them jump off the page and stand out making them easy to distinguish from one another. And I can't help but love the good guys and the bad in this book. I love the way this is told from third person, YA isn't often written in this POV and I really enjoy getting to read it. It could be because I prefer writing in third person myself or I just prefer the way third person reads. The reader is allowed to get into the characters heads, but we don't have to live there for the whole book. It helped me to get to know each character, and not only the main ones, but the minors as well. I liked the wide arching feel that it gave the book. The pacing in City of Masks is very good, it's never too fast and rarely feels slow. The story goes a lot of places and covers a good deal of time but every scene feels like it belongs. I enjoyed the back and forth between Bellezza and the modern world and the transitions were very well done. It was interesting to see how Lucien reacted to each one, and how the two of them affected one another. There aren't many shockers in this book, but when you get to them they do surprise you. Even reading through this a second time I was still on the edge of my seat at certain points waiting and hoping to see what happened to some of my favorite characters. City of Masks is a fun engaging historical read that will take you further than the past and make history fun. The other books in this series are also all very good and I highly recommend the entire series to anyone needing a good historical fiction, story about Italy, light fantasy, or just good read.